The Magic Red™ Cathepsin L kit uses a quick and easy method to analyze intracellular Cathepsin L protease activity in whole living cells. Cathepsin Magic Red™ kits measure Cathepsin L protease activity by detecting active cathepsins in whole, living cells. These kits do not work by using antibodies or as an ELISA. 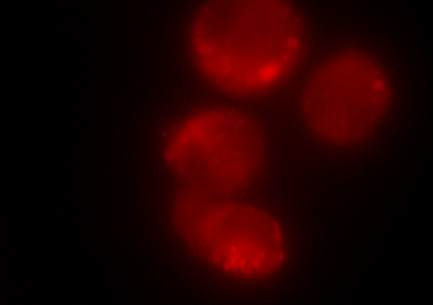 Instead, their methodology is based on a cell-permeable and non-cytotoxic reagent which is cleaved in the presence of cathepsins to produce a fluorescent product. The Magic Red™ reagent contains a Cathepsin L target sequence peptide (FR)2 linked to a red (Cresyl Violet) fluorescent probe. 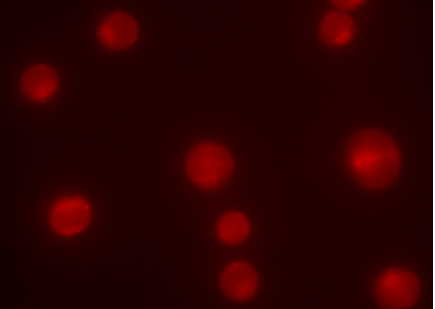 The Cathepsin Magic Red™ kits are suitable for cells in suspension and adherent cells from many species including mammalian, insect and yeast. Different cell types, e.g. Jurkat, HL-60, THP-1, fibroblasts, UMUC-3, MCF-7 and U937 cells have also been successfully studied with these kits. This kit can be used in fluorescence microscopy or with fluorescence plate readers using black microtitre plates. Protect the MR-(FR)2 reagent from light at all times. Once reconstituted, the 260X MR-(FR)2 stock should be stored at -20°C protected from light. Magic Red™ is a trademark of Immunochemistry Technologies, LLC.